I was first introduced to skips and the glorious treasure that could be found within, by my Cousin, Greg Pigott, who is also counted as one of the greatest men I have ever known. I have found a few things over the years, odd chairs, tables and chest of drawers, all of which have a place in my heart, but then, I found this. This is Skip Find No7. 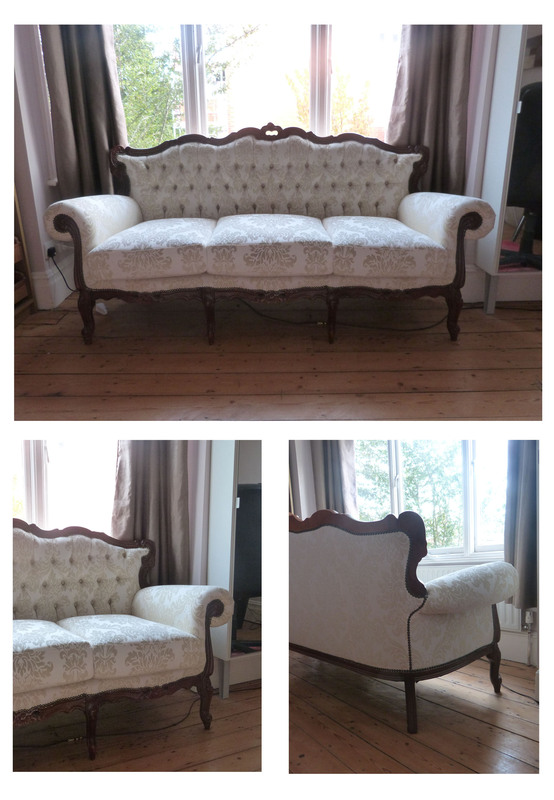 …a replica rococo style 3 seater sofa and 2 matching arm chairs! The find of my century. When you spot a gem like this in the skip world, you have to move fast. I have seen item s before and hesitated. It only ends in regret. Thankfully, I only lived a few streets away, imagine if you will, a not so dead end side street, which a locations manager decided to film an episode of the BBC Drama Accused on, (again, they did) and rushed home, completely forgetting the sundry items I had popped out to buy from the local shop (cash and carry really, it is, Whalley Range pre Tesco Metro & Co-op). With a man in toe and a car I jumped into the skip. One of the fun parts of skip hunting is the passers-by, the stares are more jealous glares and the brave project commentary to encourage. This occasion was not to disappoint as it appeared the first passerby was also aiming for the same treasure, only to graciously bow out of the challenge and nonchalantly change direction with a nod of congratulations. The other passerby turned out to be an acquaintance of the previous occupants of the house and reminisced of the good times he’d had sat on that very sofa. I looked down at its stained pink velour covering, shuddering at the thought of what kind of history I could be touching. I found the fabric in Manchester’s infamous abakhan fabrics pay by weight, bargain bin, and was very pleased with the result having only guessed the quantities required, especially in a monochromatic damask fabric with such a large pattern repeat. This was , however, nothing to do with my skill as with such an ambitious project I did not have the time nor skill set to do the work myself so I turned to a furniture supplier of mine for help. Simon at Sitraben contract Furniture had a just the right contact and as you can see from the results they are very good. The Work undertaken was above and beyond. They not only re-upholstered and re-stained the frame work but also replaced all the back padding and put in new foam seat cushions. One detail I did not expect was the continuity of pattern repeat between each seat cushion. This is a detail I would definitely not taken into consideration had I tried this myself. With the sofa in the pale cream, I chose a contrasting pale blue colour way for the fabric for the two armchairs. Needless to say this is by far my favourite skip find to date. This entry was posted on Wednesday 12th December 2012 at 5:11 pm and is filed under Design. Oh my god amazing find! Well done for having the confidence to jump in the skip. A beautiful piece of furniture. Thanks Abby, I just wish there were more finds like this, but I suppose if there were, they wouldn’t seem so great. 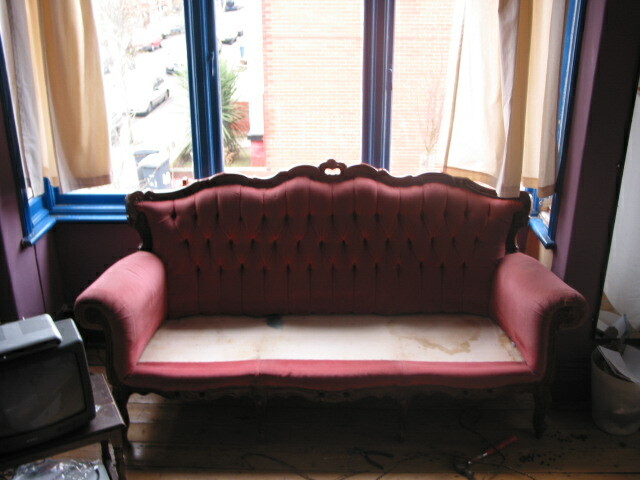 Well done Stina, the re-upholstered sofa & chairs has taken my breath away! What an amazing find. Fabulous. I was just looking for a good blog to show my sisters and I found this one. Mother Abbess thinks blogs are full of rubbish but I bet she has never been skip hunting and turned up trumphs like you.